I purchased this Charger back in December of 1996 from all the way up in Northam. The Charger is actually an XL model with no options and powered by a 245 Hemi with 3 speed auto. The drive home from Northam was quite slow since the chassis rail was badly rusted. The car had been owned by some hoons and the back end had been pranged, and the underside was also dented quite bad. The car was firstly stripped to a shell and the right hand chassis rail was replaced. 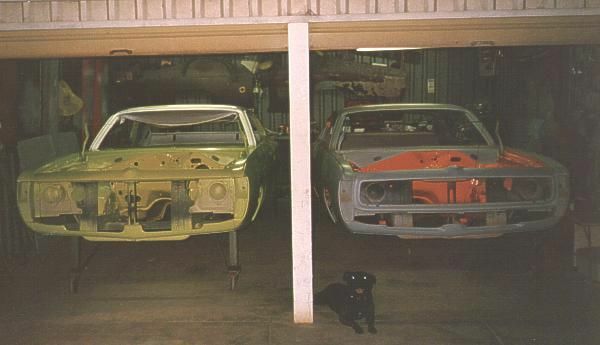 We then took the car to several panel beaters to get the rear end straightened and every one we took it to said "its not worth it, get another body" and words to that effect. The situation was not looking good so in the end my brother Bruce and friend and I decided to do it ourselves. An old car trailer was used as a jig to hold the car down, a block and tackle to pull it straight and an oxy was used to heat the rear chassis rail up. At the end of the day the car looked comparatively straighter. A new panel between the tail lights was cut from another car (R/T actually), and the car looked good. The usual rust spots in front and behind the rear wheels were replaced. Other panels replaced were the bonnet, both front guards and the nose cone. 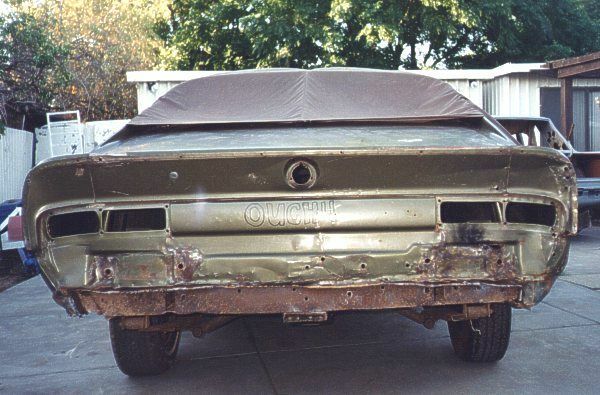 Various other rust spots have been fixed in the doors and front and rear windows. The next step was to straighten the car and cover the whole lot in primer. 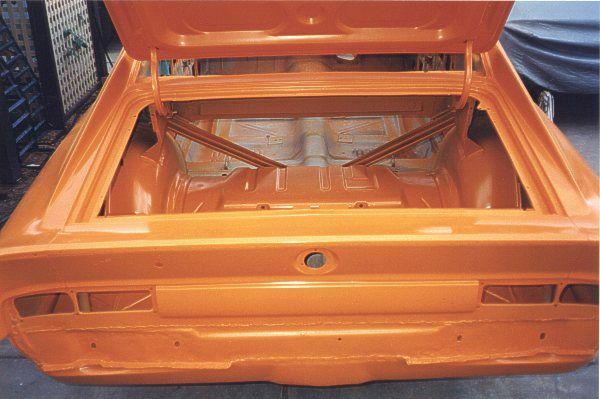 The car was then painted with what felt like 6 coats of Vitamin C. Three weeks later it showed thin spots so the whole car was sanded back and a further 4 coats were applied. This is where the car sits now. The engine, driveline (a 4 speed manual replaced the orginal 3 speed auto) and suspension was all refitted by early 2001 and then with moving house, building a new garage and finishing uni the progress of the restoration was slowed until mid 2003. 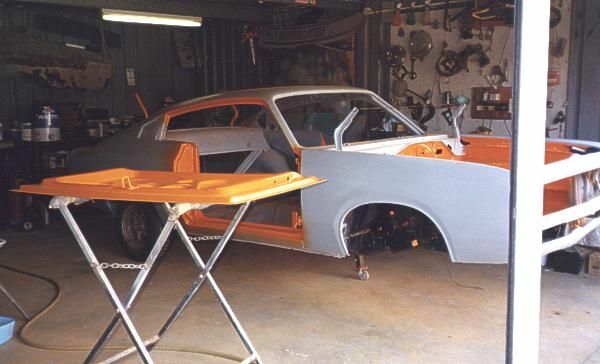 In late 2003 some significant work began again with the interior being re-upholstered, the windows being re-fitted, the brakes being overhauled and the engine being brought back to life and hence the car was drivable again. The restoration was then put on hold again when I acquired a job out of Perth in early 2004. 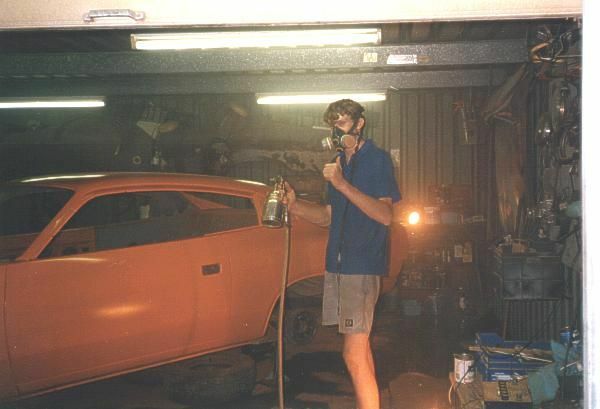 The car was left in storage at my brother Bruce's house until late 2004 when I returned for Christmas break to finish the car and organise to have it re-licensed. Bruce and I worked solidly on the car for 1 week, in this time we finished the interior, fitted the exhaust, sorted the electical wiring out and anything else which was left to bring the car up to a licensable condition. The XF disc brake diff which was destined to be fitted to the car was removed and a standard diff was fitted (un-original equipment would be difficult to obtain license without an Engineers approval - this will be done at a later stage). The car was then re-licensed on Friday 31st Dec 2004. How to manage (or not manage) a project. 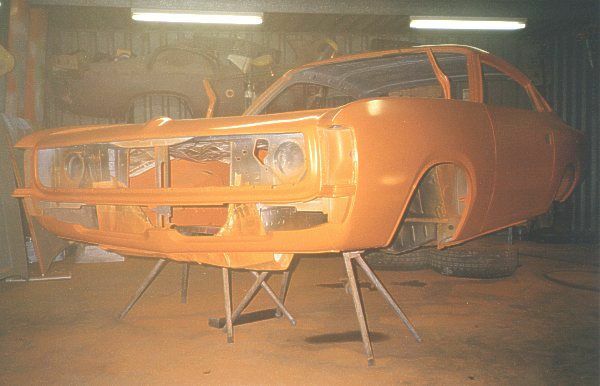 Panel preperation; use of car putty, spot putty, spray putty and primer. Panel painting; use of 2-pac and acrylic paints. Engine and gearbox breakdown and rebuild; learning the concepts and workings of an engine and gearbox. Electrical systems; learn't the basics of diagnosing faults, electrical components used, etc. 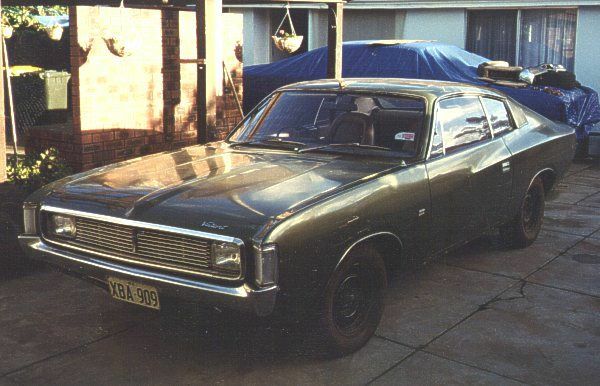 History of Chargers and other Valiants; learn't a heap about Valiant in Australia, the different models, the codes, the parts etc. I'd fully recommended anyone who's thinking to restore a car to go ahead and do it. The learnings from doing so are not just relevant to cars but fundamental to many other situations - priceless!! !